These days, air pollution is a hot topic. Ever since the industrial revolution, we’ve been sending vast clouds of noxious chemicals into the air. Even today, with our cleaning burning factories and more efficient vehicles, the airways of the cities and towns we live in are clogged with particulates and chemicals that contribute to a wide range of respiratory and general health conditions. That’s fairly common knowledge to most people, but very few of us realize that the most polluted air of all might just be inside the walls of our homes. A lack of circulation, combined with toxic cleaning products and off-gassing furniture and textiles can make for one heady mix of air pollution inside most areas of your house, and the scary thing is you’re breathing that tainted air in half your life. So what can you do about it? Surely that polluted air inside your home isn’t doing your health any favors, and it wouldn’t be too much of a stretch that improving your indoor air would help relieve little Timmy’s asthma or little Charlotte’s allergies. Luckily, the path to cleaner indoor air is easier than you might think. Here are six indoor plants that will cure your asthma, bronchitis and more… simply by cleaning your air. In addition to providing a sensuous, sculptural flair to any living area of bedroom, snake plants are one of the most powerful ways to remove airborne pollutants from your home. In a 2014 study that compared the air-purifying abilities of 12 different indoor plants, snake plants turned out to be the most effective for removing the volatile organic compound (VOC) toulene. And because toulene is a leading cause of asthma, a little less toulene in your air, thanks to snake plant, is definitely a good thing. And while we’re on the topic of animal-themed plants, that same 2014 study showed that spider plant, another easy-to-grow indoor shrub, was the most efficient out of the 12 for ethylbenzene removal. Ethylbenzene is another toxic VOC which has been strongly linked to various forms of cancer, so there’s really no question as to whether you should invest a few dollars in a spider plant or two. Spade-leaf philodendron was arguably one of the first indoor plants to be studied for its role in combating air pollution. In a series of studies conducted by NASA, spade-leaf philodendron was shown to efficiently remove large airborne concentrations of formaldehyde, benzene and carbon monoxide from indoor air… all of which can cause anything from cell mutations to sudden death. Incidentally, philodendron is one of the easiest plants to grow. I have it growing all over my house, and it’s less about keeping it alive than from taking over the entire living room! Another common household plant that’s dynamite in ridding your home of toxic airborne pollutants is aloe vera. In addition to it’s wonderful uses as a home remedy, aloe vera has also been shown to filter pollutants like formaldehyde and benzene from indoor air. Few would disagree that peace lily is one of the most calming, pleasant indoor plants to have around the house. But in addition to it’s soothing aura and pleasant aesthetic, peace lily (a genus that includes around 40 different species) has also been scientifically proven to remove benzene, toulene and n-hexane from indoor air. N-hexane is often found in lacquers and wood finishes, and has been linked to sensory loss and general health issues. In a 2011 study that compared the formaldehyde-purifying capacity of four common indoor plants, English ivy emerged as the clear winner. As a well-known carcinogen and cause of conditions like chronic bronchitis, it’s surprising just how prevalent formaldehyde is in the average home — it can be found in household cleaners, particle board, furniture polish, glues, certain fabrics, plywood and more. So, setting up a few pots with English ivy around the home to combat this health hazard is definitely a good idea! 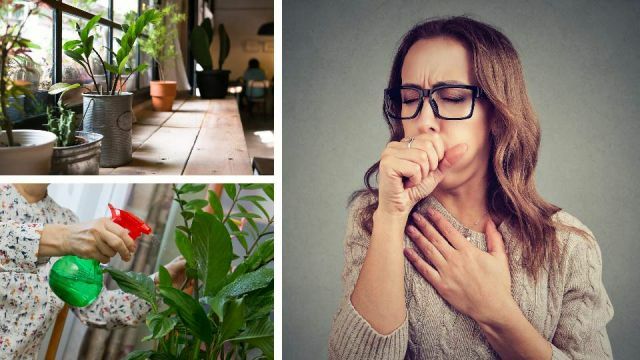 Hey Buddy!, I found this information for you: "6 Indoor Plants To Cure Asthma, Bronchitis And More". Here is the website link: https://www.thealternativedaily.com/6-indoor-plants-to-cure-asthma-bronchitis-and-more/. Thank you.